Waldemar at the 55th Venice Biennale. The evidence for this worrying development is supplied in bucketloads by the biennale’s central exhibition, called the Encyclopedic Palace. The name comes from an impossible building envisaged by a self-taught American loner called Marino Auriti, who beavered away for decades in a garage in Pennsylvania designing a museum that would contain “all human knowledge, bringing together the greatest discoveries of the human race, from the wheel to the satellite”. Auriti’s museum was going to be housed in a 136-storey tower, 700 metres tall and taking up 16 blocks of Washington: imagine a round version of one of ­­Stalin’s Moscow skyscrapers. It got no further than the model stage. That model is at the front of the show and provides the 2013 Venice Biennale with its theme and its thrust. The exhibition that follows — divided between the two main biennale venues, the Giardini, where the national pavilions are clustered, and the Arsenale, the former naval dockyards of Venice — is inventively cast. In the main gardens, the display opens with no less a figure than Carl Gustav Jung, represented by an eerie painted book of his private visions, which begins with a dream about God defecating on Basel Cathedral. The next exhibitor is Rudolf Steiner, the influential Austrian occultist and teacher, who began his educational journey by joining the theosophists, the potty religious mind-cult founded by the fraudulent mystic Madame Blavatsky. Steiner’s mystical outpourings, scrawled on a series of messy blackboards, have had a profound influence on an important generation of German artists, headed by Joseph Beuys. Thus, the Encyclopedic Palace lays down some weird cards on its opening table: psychotherapists who dream of defecating gods; ex-theosophists scrawling on blackboards; outsider artists ­toiling away in garages, designing Stalinesque towers. This is art presenting itself as an alternative to reason, art ­pretending it has access to a higher truth. Move over, Scientology; art is here. Add to this creepy creative agenda the sight of thousands of interchangeable art-world inhabitants gliding monkishly through Venice in their designer black, speaking their obscure artspeak, and you have an image worth worrying about. Who should pop up at the far end of the show but Aleister Crowley, with a set of new-age paintings that reimagine the tarot pack? Worrying as all this is, it does make for a stimulating journey. Plenty of the artists involved in the Encyclopedic Palace have never been shown before and were ­discovered by the exhibition’s curator, Massimiliano Gioni, in the deep murk of art’s basement. Achilles G Rizzoli, from Oakland, lived with his mother all her life and made obsessively detailed ­drawings in which he imagined her as a 1930s skyscraper. Hilma af Klint received divine messages from a set of otherworldly beings called the High Masters and preserved her visions in a suite of delicate astral paintings that are now ­recognised as pioneering works of abstraction. Shinichi Sawada, from Japan, was born with severe autism and barely speaks, but his spiky ceramic dragons have such a fierce presence. By including all these “outsider” artists in its main event, the Venice Biennale is, of course, turning them into insiders. The biennale is keen that we view this as an act of liberation, but it is actually an absorption. The art world’s ability to expand its territory into new areas of profit is already one of the economic marvels of our time. If anyone reading this piece has some money to invest, I recommend a quick trawl through the world of loners, Unabombers, occultists, people who paint in garages and artists who live with their mothers. Their prices are sure to rise. Elsewhere in the Encyclopedic Palace, among its better-known art names, the emphasis remains on the surreal, the unexpected, the visceral. It’s a clear move away from the deadpan coolness of ­conceptual art and involves frequent trips to Africa and the unchaining of many a tortured id. As usual, there are lots of films to sit through, but they tend to be playing on noisy old projectors, casting jumpy images on flickering screens. This espousal of touchability and passion is the best thing about the show. In the Arsenale, in particular, there are many fine stretches of art, culminating in a superb section curated by Cindy Sherman, in which a rich mix of insiders and outsiders, art-school types and garage types, circle the elusive prey that is human identity. Bravo to Sherman for her selection, which succeeds also in making her own work appear less theoretical and more magical. The big guiding idea of the Encyclo­pedic Palace — that universal knowledge recognises no boundaries — continues in a diluted form in the national pavilions, where the main biennale powers twist themselves into knots trying to be simultaneously themselves and part of a greater whole. Thus, Germany and France have swapped pavilions in an act of creative co-operation decided on in the Sarkozy-Merkel era, which doesn’t look so clever today. My recommend­ation to both of them is to pop over to the Greek pavilion, where Stefanos Tsivopoulos has made three charming films charting the growing worthlessness of the euro. In the final one, a black down-and-out finds a bag of discarded euro notes in a skip. Inside the adopted French pavilion, a severe German display hands over its largest space to a grotto of wooden stools created by Ai Weiwei, the Chinese hero-artist who pops up all over this biennale. However hard I scrunch up my eyes, I cannot turn Ai Weiwei into a German ­artist. The sheer ridiculousness of having him in the German pavilion undoes much of the good work achieved elsewhere by his art. In the Kenyan ­pavilion, meanwhile, seven Chinese ­artists outnumber three Kenyans! The ­biennale authorities are attempting to pass off this dubious nationality-­swapping as examples of healthy internationalism, but they are actually acts of colonisation. I go to the Kenyan pavilion to see what is happening in Kenyan art, not to watch yet more Chinese artists flooding the biennale with expensive special effects. In general, the national pavilions are weak and bleak, with a small handful of standouts. In the Israeli pavilion, Gilad Ratman has organised an ingenious ­happening involving a group of mys­terious underground sculptors who ­disappear down a hole in Israel and emerge through another hole in the Venetian pavilion, where they produce a set of screaming self-portraits from the clay they have brought with them. Bill Culbert’s Daylight Flotsam Venice (Jennifer French)Happily, our man in Venice, Jeremy Deller, is a conspicuously sane and light-fingered presence, who keeps his id chained up and his tarot cards unpacked. Driven perhaps by the knowledge that the Welsh have their own pavilion now, and the Scots, and the Irish, as well as the good people of Bournemouth, and even the inhabitants of Peckham, Deller’s display, called English Magic, seeks bravely to express the spirit of ­Englishness, rather than the more usual Britishness. This English spirit, says Deller, can be recognised in various forms: in the ­pioneering craft aesthetic of William Morris; in the ancient might of Stonehenge; in the songs of David Bowie; in the protests against the Iraq war; in the beautiful flight of the hen harrier; and in the fact that the British pavilion used to be the biennale’s tearooms, and is now once again dispensing free cuppas to ­all comers. All this is presented in a ­documentary mix of photographs, ­drawings, films and objects, culminating in a hilarious mural of William Morris throwing Roman Abramovich’s yacht into the Venetian lagoon — a reference to the last biennale, when the Russian billionaire parked his particularly big boat directly in front of the biennale gardens. Deller’s honourable showing could perhaps have done with some bigger wows thrown in, but at this biennale, its understatement stands out. The Welsh, represented by Bedwyr Williams, are also impressive, with an action-packed pavilion, set in the dark, where the outstanding work is a ­miniature observatory in which an unseen astro­nomer can be heard ­weeping contin­uously as he trains his telescope on the stars: so far and yet so near. Unfortunately, the Scots have let us down, with a forgettable trio of shows from Hayley Tompkins, Corin Sworn and Duncan Campbell. 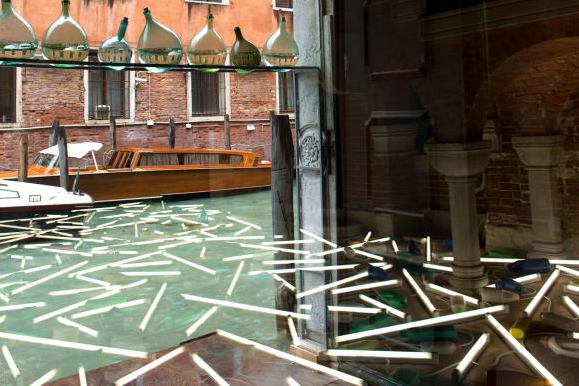 My favourite pavilion was New ­Zealand’s, where Bill Culbert’s lovely neon interventions, scattered about a crumbling Venetian church, avoid the spiritual angst that characterises much of the biennale, and replace it with delicacy and light. 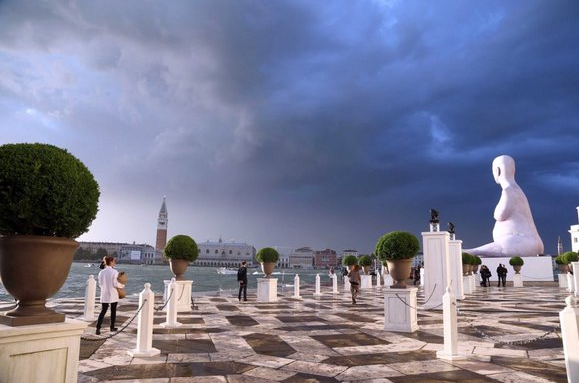 Out on the fringes, an ambitious Marc Quinn show at the Cini Foundation announces itself to anyone going from A to B in Venice with a huge inflatable version of his heroic statue Alison Lapper Pregnant. Born with truncated arms and legs, Lapper proudly measures her version of humanity against the countless ideal Venuses that surround her in Venice. There was much grumbling at the biennale by those who felt there was something demeaning about the inflatability of Quinn’s unmissable monument. I thought it was one of the few truly spectacular sights at an event that was otherwise short of bigness.